A lot has changed for Chelsea Peretti and Jordan Peele since Peele’s horror masterpiece, Get Out, premiered at the Sundance Film Festival back in January 2017. His professional life has changed irrevocably with multiple award wins and nominations — including being only the fifth African-American man to earn an Oscar nom for Best Director — as well as being the brains behind a movie that managed to create a huge cultural moment. The movie had such a strong impact on so many people, and was one of the most original, captivating films we’ve seen in some time. And things have been huge on a personal level, too. Peele and his wife, Brooklyn Nine-Nine‘s Peretti, welcomed their first child — a baby boy named Beaumont Gino Peele — back in July 2012. So yeah, it’s kind of a huge time for Jordan Peele and Chelsea Peretti — two brilliant, talented, and funny people, who comprise one of our favorite couples ever. The two are so incredibly supportive of one another and are always ready to cheer the other one on when they accomplish something great. So to celebrate this couple’s awesome year, we’ve compiled some of our favorite moments of the two together. We know now that Peretti and Peele ended up eloping for their nuptials, but that didn’t stop Booking.com from partnering with the couple for some fun, wedding-themed commercials. While the travel site did some commercials that focused on Peele’s former comedic partner — Keegan Michael-Key traveling to the wedding and setting up the bachelor party — there were also some adorable ones of Peretti and Peele deciding on their wedding locale together. Even though it’s an ad, the two are just too adorable together. Peele and Peretti are pretty chill when it comes to big announcements, so it’s not a surprise that the two ended up eloping and dropping the news in a pretty blasé fashion on Late Night with Seth Meyers. Though speculation had been brewing that the two had secretly tied the knot, Peele snuck the news into a bit on the late night talk show. The whole bit is funny, but the announcement starts at 3:45. Peele and Peretti might be comedians by trade and they can be pretty private when it comes to how they portray their relationship in public (which makes perfect sense to us), but it doesn’t mean they’re not 100% supportive and crazy in love with one another. Peele said in an interview with Us Weekly that Peretti was his rock during the craziness following Get Out‘s smash success, and he even called her the “funniest person in the world.” And back before Get Out was in theaters, he was right by her side, supporting her on the red carpet for her success on Brooklyn Nine-Nine. We loved her tweets that celebrated her husband’s Oscar noms alongside the fact their baby slept through the night — if you have kids, you know that’s a huge deal. These two are the perfect blend of adorable, hilarious, and ultra-supportive of one another. They are the type of celebrity couple that you love to see find success in their personal and professional lives, and we’re so happy that this has been such a stellar year for the two. 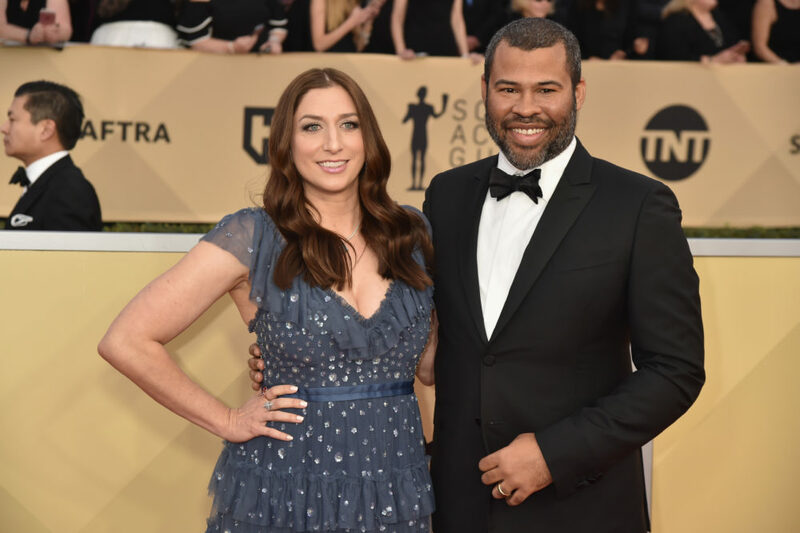 We can’t wait to see Chelsea Peretti and Jordan Peele on the red carpet together at the Academy Awards this year!